An exploration of the Willamette Falls Legacy Project, which aims to transform and develop the former 22-acre Blue Heron Paper Company mill site just southwest of downtown Oregon City. Originally appeared in the Winter 2015 edition of Metroscape, published by the Institute of Portland Metropolitan Studies, Portland State University. Tremoulet, Andrée (2015). 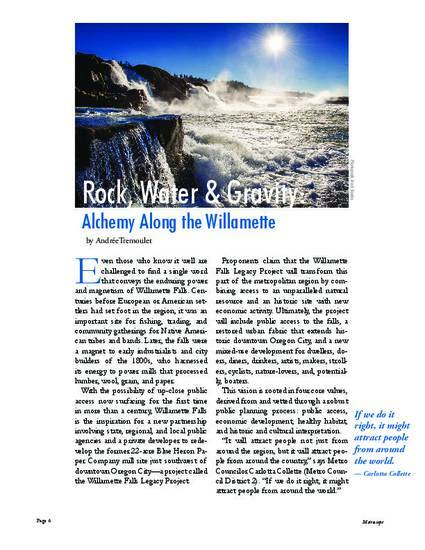 "Rock, Water, and Gravity: Alchemy Along the Willamette," Winter 2015 Metroscape, p. 6-12.